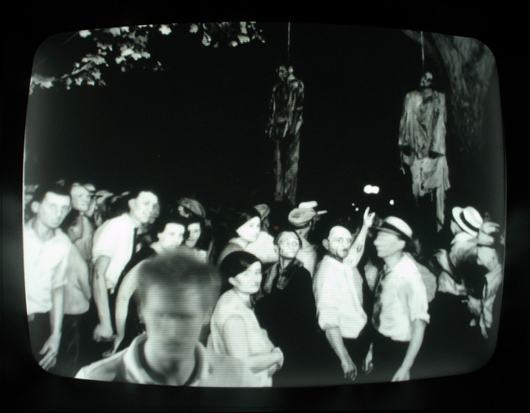 Lately I have been doing a bit of research about the “erasure” of images (for a small film program), and while doing so I stumbled into Ken Gonzales-Day‘s work, in particular his Erased Lynching project. 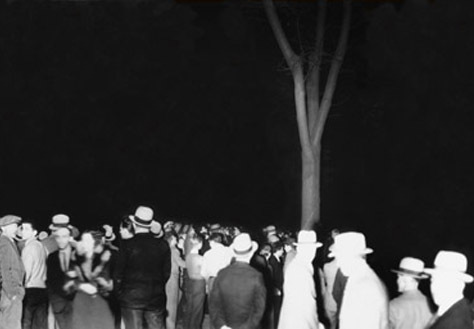 In this series of photographs, he appropriated images from historical lynching postcards and digitally “removed” the lynch victims, leaving the crowds of onlookers. Gonzales-Day made this work around the same time as the ‘Without Sanctuary: Lynching Photography in America’ exhibition was travelling through the States (2000 – 2002), which was the subject of intense critical debate. 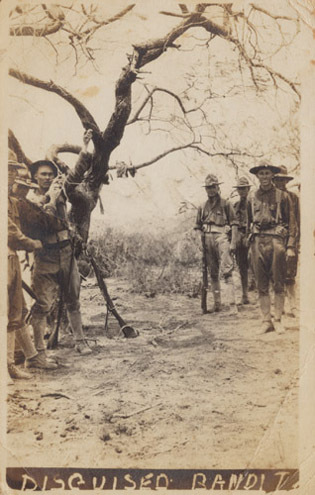 Commenting on this exhibition, Dora Apel wrote: “When we look at lynching photographs today, we try not to see them. Looking and seeing seem to implicate the viewers, however distanced and sympathetic, in the acts that turned human beings into horribly shamed objects, as if viewing itself was a form of aggression. Most of us would prefer not to look.” I found this quote in the essay ‘Not looking at Lynching Photograps’ by James Polchin (part of the reader ‘The Image and the Witness. Trauma, Memory and Visual Culture’, edited by Frances Guerin and Roger Hallas). In this fascinating essay Polchin tries to come to terms with exhibiting and viewing these images. How do you display photographs of racist violence without replicating the spectacle of violence? This is a complex question, especially considering the fact that these photos actually furthered the precise project of lynching, as powerful visual symbols that helped to rationalise white supremacy in the U.S. Southwest. Furthermore, Polchin raises to problem of how we ought to look at these images. He quotes Hilton Als (who wrote a piece for the published monograph to the exhibition – a tome of images that oddy resembles a coffee-table art book): “What I see in those pictures… is a lot of crazy-looking white people, as crazy and empty looking as the white people who stare at me. Who wants to look at these pictures? Who are they all? When they look at those pictures, who do they identify with? The maimed, the tortured, the dead, or the white people?” These images, whether presented as art, as historical documents or memento, present an uncomfortable display where the complexities of photographic representation and historical witnessing challenge our assumptions about what an image can tell us. They, as Polchin writes, “shaped an experience of not looking, of filling that ambiguous and complicated space between event and representation, between witness and image”. One wonders then about the impact of Gonzales-Day’s work. With this project he wanted to “raise awareness of sniffing history of racial violence in the United States”. While investigating the history of the lynching of Latinos in California, he discovered that the majority of Lynchings were perpetrated against Latinos, Native Americans, and Asian Americans; and that more Latinos were lynched in California than were persons of any other race or ethnicity. Just as these events have been “erased” from history textbooks and the minds of most Americans, so too have the anonymous victims been erased from his photos – paying tribute to the victims while also placing the people who watched and/or committed these atrocities (and those who distributed these images, in stores and through the post office) front and center to face their crimes. 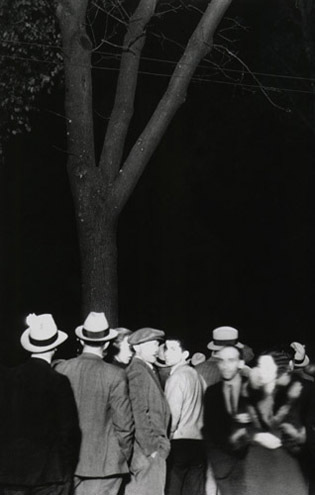 This conceptual gesture is intended to “direct the viewers attention, not upon the lifeless body of lynch victim, but upon the mechanisms of lynching themselves: the crowd, the spectacle, the photographer, and even consider the impact of flash photography upon this dismal past. The perpetrators, if present, remain fully visible, jeering, laughing, or pulling at the air in a deadly pantomime. As such, this series strives to make the invisible -visible. These absences or empty spaces become emblematic of the forgotten history made all the more palpable in light of the recent events surrounding the resurgence of the noose as means of intimidation and instilling fear everywhere from the workplace to the schoolyard”. Clearly, Gonzales-Day is deeply concerned with issues of spectacle, complicity, history and the construction/erasure of the other involved in dominant subjectivity formation. By editing out the abject object of victimhood, the act of bearing witness is emphasized (In an installation setting, some photos are blown up and stretched over two facing walls – one, a matte finish, the other, a reflective finish that mirrors the viewer so that s/he appears among the onlookers), allowing us to re-evaluate what we are looking at – or not looking at. update 15 december 2008: Pieter-Paul Mortier (who organises the ARTEFACT festival at art centre STUK in Leuven) pointed out that Ken Gonzales-Day’s project has quite a bit in common with some installations by Oliver Lutz, although the exploration of the interweaving of witnessing and complicity has been taken a step further here. 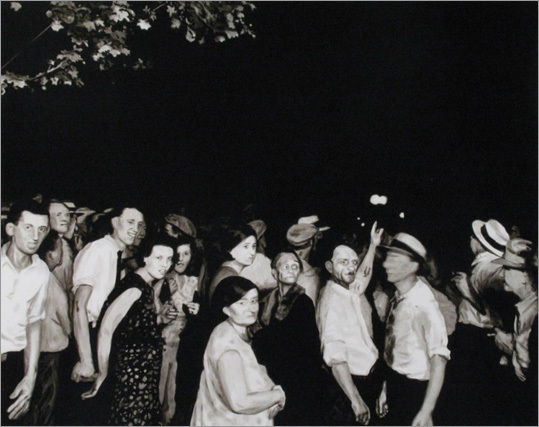 Lutz repainted this photo, using infrared reflectography, a method developed in the late 1960s that enables art historians to examine hidden layers in paintings. Infrared radiation can make the outer skin of a painting appear transparent. In the installation a CCTV monitor displays a live surveillance video of this painting and the viewer while watching the monitor. 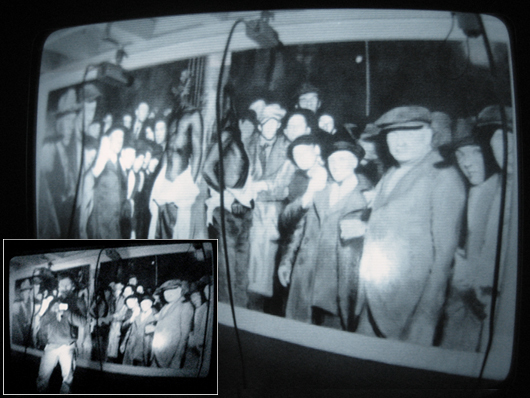 The bodies of the deceased are only visible to the viewer once s/he looks in the monitor (and inadvertently becomes part of the spectator mob). This installation consists of 10 ceiling mounted cctv cameras, which are situated facing a large painting based on this photo. CCTV video monitors situated on the floor show close-up portraits of people in the lynch mob otherwise not visible to the subject. The monitors face the painting so that the subject, when viewing the video monitors, inadvertently put himself in front of the cctv cameras and into the video frame.